AlphaLab products are great at measuring various physical quantities (magnetism, electric field, etc.). Now they can do even more! Some of our products can be ordered with a hardware data recording option and software. These provide a complete data acquisition solution. 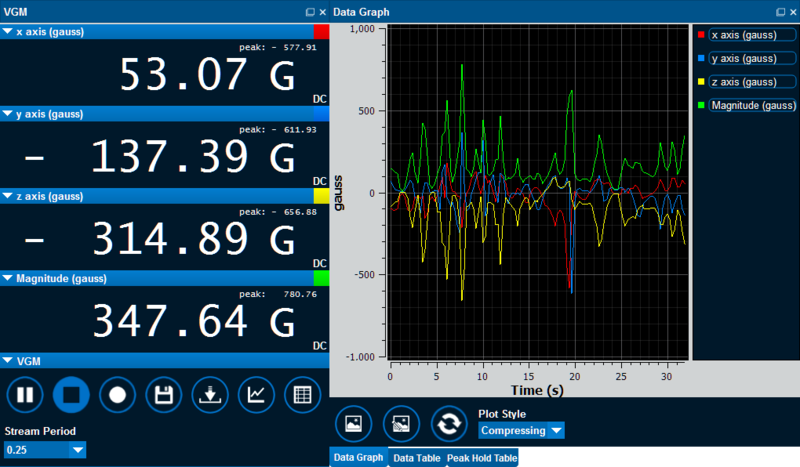 Get data from measurement to data files on a PC with a single product. AlphaApp is an easy to use software application that provides data logging and data capture capabilities for AlphaLab Inc. meters that have USB capabilities. The easy to use interface gives users the ability to record, download, and stream data from meters to most computers. The data can be viewed on a computer or saved to a text file format easily read by any software with text reading capabilities (i.e., Excel, Matlab, C++, C, etc.). Tethered Recording – AlphaApp can stream data at varied intervals while connected to a PC. Stand Alone Recording – Data can be uploaded later using AlphaApp. Over 100,000 data points can be stored or re-written repeatedly to non-volatile memory on a meter. Data Plotting – Multiple-axis data can be visualized using line plots. Live Screen – AlphaApp can extend the screen information on the meter to a PC. Example of live screen and data plotting operating in tandem with the Vector/Magnitude Gauss Meter Model VGM. An FTDI driver is required to connect over the virtual com port. The driver is available for many different operating systems and can be downloaded from FTDI’s website. The following communication protocol can be used to program your own software using a virtual com port with an FTDI driver. 1.0.7 11-9-2016 Added absolute time option in preferences. 1.0.8 6-30-2017 Comm port stability improvement for Windows 10. Added error message when loading incorrect data files.